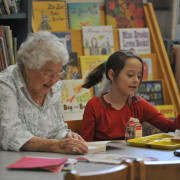 Reading together is fun no matter your age! Change a child's life in just one hour every week-be an Everybody Wins! reading mentor at Barton Academy & Graded School in Barton.